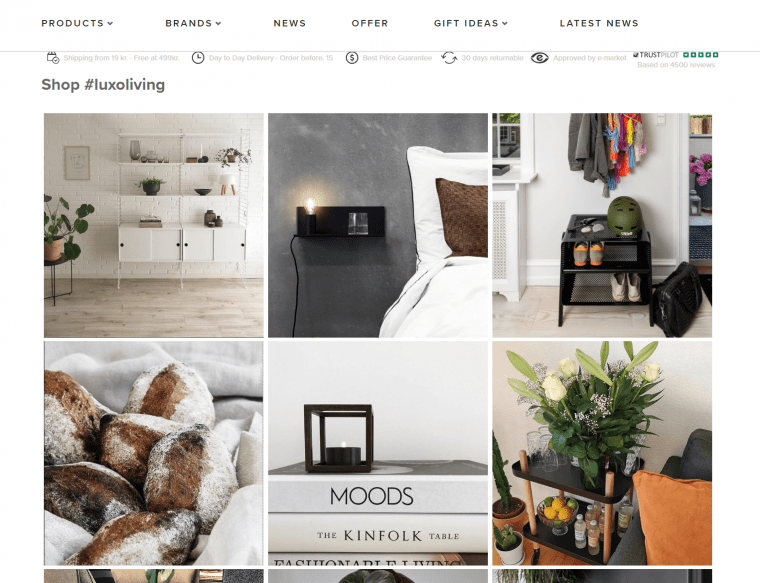 At Luxo Living, we want to position our website as the leading home and interior webshop that offers the latest in trends and product news. Our goal is to to get customer to see Luxo Living as the place to shop for new trending products. We want to differentiate ourselves by focusing on providing customer with the latest in trends and style rather than constantly pushing deals and special offers like many of our competitors. We’re focused on creating an immersive and inspiring experience for customers, not an ad page. We have made our focus new trends and products rather than deals and special offers like many of our competitors. This is very important to our team and we’re taking every opportunity in our user experience to show case this. It’s important for us that the webshop has something new to offer every single day, which is why we add 10-30 new products on a daily basis. We want customers to feel that they will find something new and interesting every time they visit Luxo Living. We’re consistent on our other pages as well. We also post 2-3 product news on Instagram everyday, and send out a weekly newsletter with the most exciting news on trends and products to make sure we are engaging with customers where they want and with what they want. However, every single day there are many there are plenty of new visitors, who have not signed up to our newsletter and who don’t follow us on Social media (yet). These potential customers mostly find us through Google searches and land directly on groups of specific products after entering our website. They don’t necessarily land on an engaging landing page. 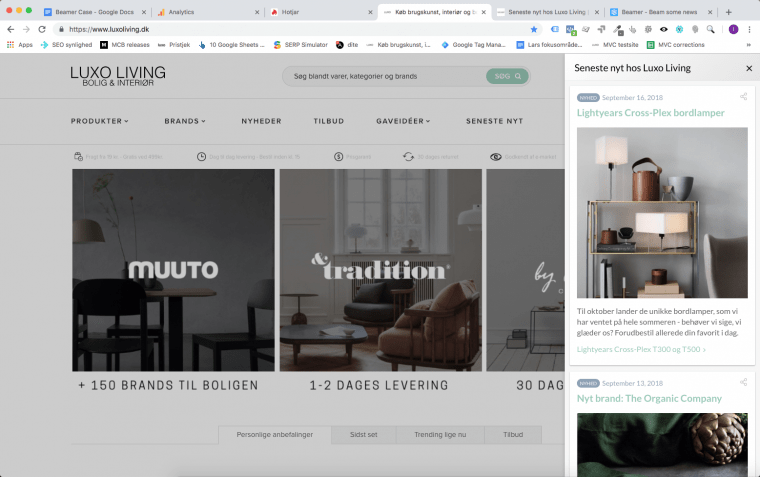 These new visitors accounts for 60% of our total traffic, and can be hard to convert into buyers because we don’t have have the ability to communicate or engage with them once they leave luxoliving.dk. 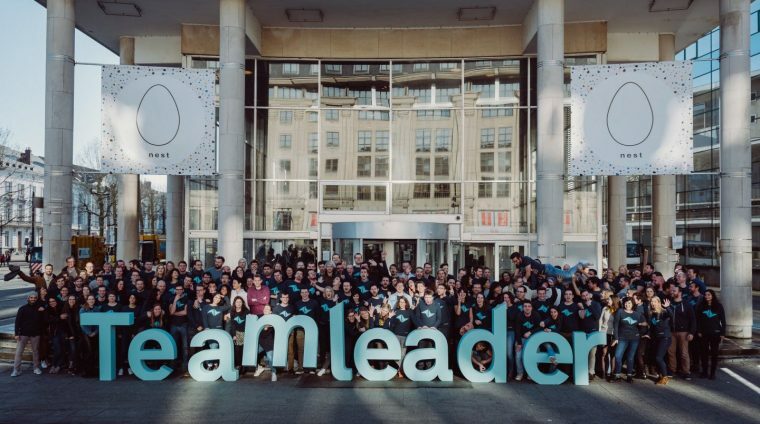 We believe the key to converting these new visitors is to make sure they see how dynamic and consistent we are in bringing the latest in trends and they know about our focus on trending products. We want to create the feeling that they’ve come to the right place for design trends. To support our goals, we were looking for a new way to engage users effectively. 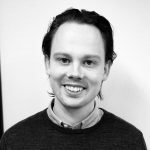 We wanted to find a way to engage users on the site for the first time who came in from anywhere. We’ve found Beamer to be the perfect tool. Our Beamer feed opens up when a user clicks “Latest News” which is in our main navigation. Our feed is updated with small updates about new products and brands 2-3 times per week. The Beamer feed opens up when a customer clicks “Latest News” in a discreet sidebar. The Beamer newsfeed can be opened from any page on our site, no matter when they come in from. They can scroll through and explore latest trends and products like a social feed. From any page, users get the sense that our Luxo Living is dynamic and consistent in updates. Do our customers use our Beamer feed? The definite short answer is yes! Looking at the heatmap of our top-menu, it’s clear to see that “Latest news” one of the most popular menu options. Based on our Google analytics results, we also know that 10% of all visitors open up the “Latest news” sidebar and that the sidebar has a 9% CTR from updates to the new products. We are quite satisfied with the performance as that means almost 10% of all traffic, new and returning, gets to our products with this simple tool. That is a bit lower than open rates and CTR on an average newsletter, but since it is based on all site visitors, including new customers, we are quite satisfied with the performance. Customers who interact with “Latest News” vs non-users:. What’s incredible is that the Beamer users are 50% new visitors. With Beamer we have reached our goal of engaging new users. 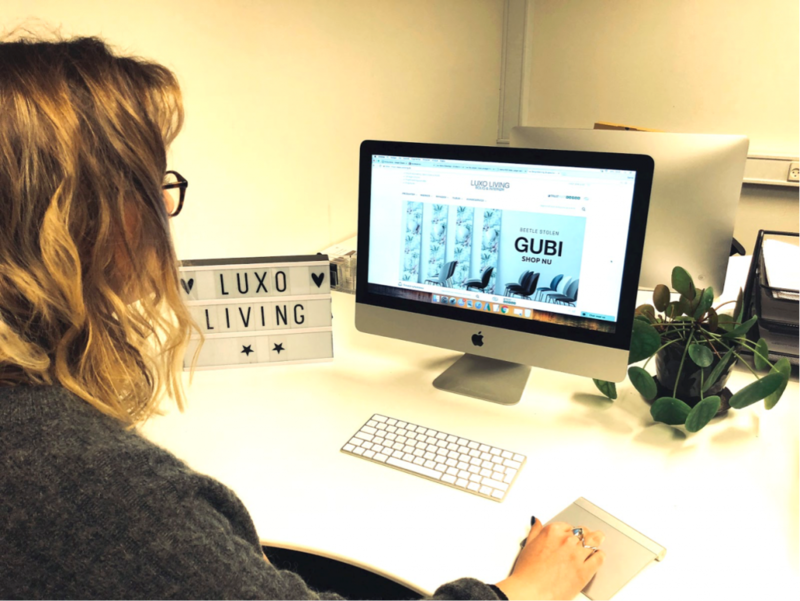 With Beamer we are able to communicate our value and get them exploring Luxo Living no matter what page they come in on.